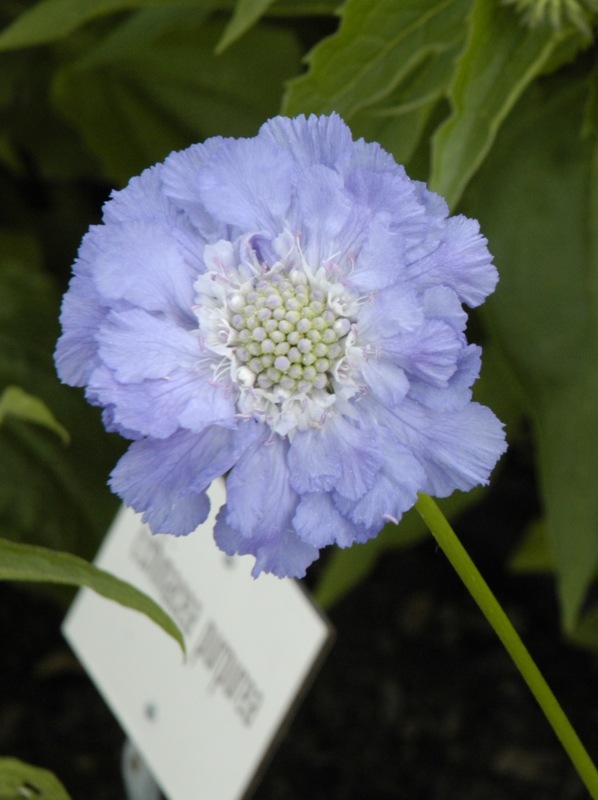 A lifetime ago, when I made my living as a floral designer, I was asked what my favorite cut flower was, and often my answer was this, Scabiosa caucasica, the sweet scabious, or pincushion flower. Unfortunate name, isn’t it? The plant’s ancient medicinal use was the treatment of skin irritations, making that ugly generic name more understandable, if not more aesthetically appealing. Its native range is the Caucasus Mountains, vaguely northeastern Turkey and points east. It was painted on the walls of Pompeii, and grown in mission gardens in California even before Jane Austen was born. Clearly a well-traveled plant. And, it is beautiful. The sweet scabious is an herbaceous perennial, meaning it goes dormant (appears to die) in the winter, and restores itself every spring to flower in the sun throughout the growing season if you do not allow it to set seed. It attracts pollinators like bees and butterflies to your garden. Its vase life is about 10 days if you harvest it at the state you see it in here, with the central composite florets still tucked closed, giving the center its distinctive quilted look. The color ranges from pale to near cobalt blue, and here you see a plant from the Isaac House Hybrid strain. The best blue, however, comes from the cultivar ‘Fama’, or ‘Fama Blue’, a luscious shade of periwinkle. There is also a very good white form, ‘Alba’. Okay, it’s pretty and lasts well in arrangements. But cut to the introductory scene of the 1995 Pride and Prejudice, as Elizabeth Bennet winds her way home from a walk along the Hertfordshire hedgerows, and you’ll understand my fascination. She is carrying Scabiosa. They had me right then and there, even if the acting hadn’t been brilliant and the screenplay genius. Although I don’t mention Scabiosa caucasica in The Red Chrysanthemum, it was there in spirit. The “business” of the eldest Bennet sisters in the 1995 Pride and Prejudice is often flower-related. Lizzy and Jane are seen gathering flowers and tending their mother’s garden, Lizzy and Jane bundle flowers and herbs for decoration and fragrance for the house, Lizzy carries a pitcher of flowers into the dining room as Mr. Collins hovers about her like a fat greasy bumblebee, and, most iconic for me, Lizzy carries sweet scabious into the house in the very first scene. It wasn’t much of a stretch for me to imagine Lizzy happily occupied as a gently bred-young lady would be, in the family stillroom working with flowers and foliage to create teas, scented water, drying herbs for the kitchen, following recipes for strewing herbs and sachets to sweeten the house; all of this coalesced to bring her, in The Red Chrysanthemum, into the Pemberley stillroom. The meaning of sweet scabious is Admiration. Well, really…what’s not to admire? This entry was posted on September 19, 2013, in The Plants in The Red Chrysanthemum. Bookmark the permalink. ← TRC Now in Paperback!